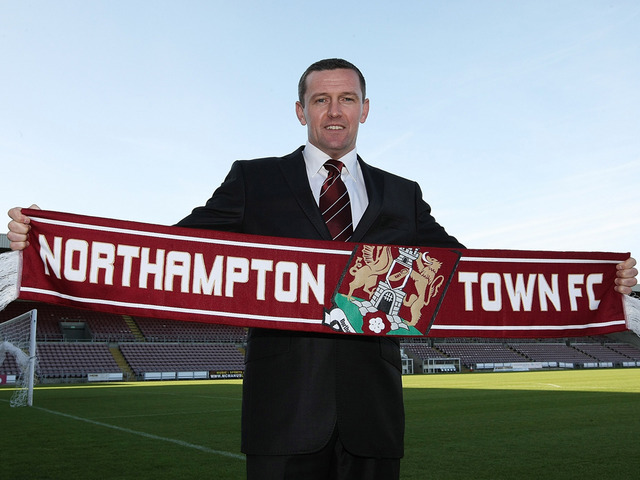 The Football Front’s Lower League Expert Matt Bruce explains why Aidy Boothroyd is a fantastic appointment by Northampton Town. Northampton Town are a confusing club to get to grips with. With a wealthy benefactor and a healthy fanbase, this club has bags of potential, yet for some reason they find themselves continually locked in a battle for Football League survival. Northampton are something of an enigma; a forward-thinking club reduced to looking over its shoulder at the abyss of the Conference. When David Cardoza and his pot of money arrived at Northampton in 2003 they were labelled 'the Chelsea of League Two'. At a time when other Football League clubs were frantically trying to slash budgets, Northampton were throwing money at anyone who would take it. However, eight and a half years later all Cardoza has to show for his investment is a meagre three seasons of League One football, all of which must seem like a long time ago now. The club is currently fighting to stay in the same division it was in eight years ago. Perhaps the root of Northampton's troubles is short-termism and lack of a defined long-term strategy. Since Colin Calderwood left to take over at Nottingham Forest in 2006 Northampton have had five managers, none of whom have fared particularly well. With a high turnover of managers and a revolving door of players which inevitably follows as each new boss tries to bring in their own staff. It was this which almost cost Northampton their place in the Football League last season, when Gary Johnson arrived at Sixfields with a thud. He immediately criticised the club's players in the press and undermined the side's already-fragile confidence, triggering a spectacular collapse of form which saw Northampton only secure safety in the penultimate match of the season. Having narrowly survived relegation last season Northampton began rebuilding during the summer. Johnson presided over a clearout and was given funds to replace the entire squad for this campaign, bringing in marquee signings such as Adebayo Akinfenwa (back for a second spell at the club), Jake Robinson and Arron Davies. It was made clear before the season began that Johnson had been backed to assemble a promotion-winning side and hopes were understandably high amongst the Cobblers faithful, but so far this season has been no better than the one that preceded it. Early results suggested that the side wasn't ready for a promotion push, with home reverses to Cheltenham and Morecambe coming within the first month of the season. As results gradually deteriorated and the Cobblers began to sink towards the bottom, Gary Johnson's behaviour got gradually more erratic; selling star signing Shaun Harrad on transfer deadline day amid rumours of a physical altercation between the two, then retreating to the dugout during home games and refusing to patrol the technical area, and finally placing ten first team players on the transfer list. Defeat to non-league Luton Town in the FA Cup capped a run of six defeats in seven matches and cost Johnson his job. What followed has really set alarm bells ringing in Northamptonshire, as a rudderless Cobblers were smashed 7-2 at home to Shrewsbury and followed that up with a 4-1 defeat at the hands of basement side Plymouth Argyle to leave them slumped in 21st place, just 3 points above the dreaded relegation zone. Northampton's poor start to the season has left their team demoralised and totally lacking in organisation and so far they have been getting consistently worse. What the club need most from a new manager is someone to reinvigorate the current players and spread some positivity through the changing room, identify transfer targets for January, improve organisation and leadership and stop the defence from leaking so many goals. This is why Aidy Boothroyd was appointed as manager a week and a half ago. He is the perfect match for Northampton. Boothroyd has previous successful experience at clubs in similar difficulties, having steered Watford from troubled waters and onto promotion to the Premier League in his first job in management. His upbeat and positive demeanour would seem to be just what is required to boost spirits in what must be a pretty demoralised squad of players and perhaps Boothroyd will be able to instil some confidence back into the team. Boothroyd's style of football has often been subject to criticism (they don't call him 'Hoofroyd' for nothing! ), but he has always made it clear that he is a results man first and foremost. Entertainment is a luxury that Northampton can ill afford in their perilous position. Northampton fans who may feel uneasy about using such tactics need look no further than their own history for a justification. Ian Atkins, renowned for his ugly but effective brand of football, managed the club for four successful years, earning promotion from the fourth tier and competing right at the top of the second. In later years he carved out quite the reputation for saving clubs from relegation against all the odds – coming within a whisker of pulling off the most unlikely great escape at Chester in 2000, saving Carlisle from the drop in 2001, and pulling off a miracle escape with Torquay in 2006. Northampton fans must hope that Boothroyd can achieve similar results. No matter what methods employed.